With Halloween around the corner, we will be seeing more and more scary monsters, whether we want to or not. This reblog that was originally posted a year ago, may give you a new perspective of the monsters all around us. Categories: Catholicism, Christianity, Holidays | Permalink. How much more time will you waste feeling inadequate, and waiting for the revelation of God’s real purpose for your life? How long will you continue to pray for the Lord to reveal your true calling, as though He hasn’t already? Have you ever considered that each person and sometimes ‘mundane’ circumstances in your daily life, are all intricate parts of His Divine Plan? That maybe those people that you pass by or communicate with in such a nonchalant way, are an important part of your mission and purpose? Sometimes, they are those that you push aside and away from you. The ones who are so unlike you, or make you feel uncomfortable. Have you ever wondered about the blessings you have been blocking in the lives of the ones you cast aside? Or the blessings blocked in your own life due to those decisions? Maybe we only need to open our eyes to the opportunities God is placing right in front of our noses…the opportunities given to share His love with those in need. When we take the step forward to live and love for Christ, we will notice more and more the people God entrusts to us, and we will realize it is through these acts of love that we grow as people. It is through these acts of unselfish love that we are brought closer to Jesus, and our true personality and spirit are revealed. So as you go through your day today, pay special attention to those around you…and make the decision to love. You may find that is your true purpose. Categories: Catholicism, Christianity, God's Whispers, Somebody Loves Me | Tags: Blessings, calling, god, jesus, love, Purpose | Permalink. Today, instead of the salad that I had planned for lunch, I decided to go out. When I left the office, it was very dreary; a little chilly, no sun, and while heading in to the restaurant it started raining. Add to that the haze I have been in due to a respiratory bug I am recuperating from…my spirit really needed some lifting. As I was sitting and enjoying my lunch, a sweet little girl caught my eye. She was about two years old, with short, shaggy golden brown hair that magnified her beautiful, smiling brown eyes. She was in a cute little polka dot shirt and black leggings. As she sat on the table facing her mother, every now and again she would burst out in laughter due to unknown words her mom whispered to her. Their joy was contagious! The innocence and beauty of the love between this mother and her daughter touched me, and I felt my heart fill up. For some reason, I felt a connection with them, and couldn’t keep myself from smiling. As they were on their way out, the little girl broke free from her mom, and ran over to me. She looked up at me with those gorgeous eyes, said good-bye, then ran back to her mom. My day was changed in a matter of moments. In the past, I may have not even noticed the beauty that was occurring right in front of me. Sometimes it is so easy to be overwhelmed with the negative around or within us…we forget to open our eyes to the goodness that is always right there in front of us. As I grow in faith and maturity, I am learning to keep my eyes, ears, and heart open to God’s whispers to me. He never lets me down. Today, He was reminding me that His love is all around me, sometimes in unexpected places. And I am reminded to praise and worship my Lord and Savior, and to be grateful in all things. Need I tell you, the sun is now shining and there is no sign of rain? Categories: Catholicism, Christianity, God's Whispers, Gratefulness | Tags: Beauty, daughter, Faith, god, innocence, Joy, love, maturity, Mother, Peace | Permalink. 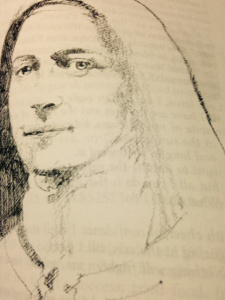 The faith and heart of Saint Therese touches my own walk with Jesus in a profound way. We are all blessed with different gifts; Love is the source of all. We get the saints we need. Saint Therese of the Child Jesus (1873-1897) inspired millions by her “little way,” which she described in her autobiography “Story of a Soul.” We can be holy in our ordinary lives, she said. Love transforms everything, however small, into a gift pleasing to God. Categories: Catholicism, Christianity, God's Whispers | Tags: 1 Corinthians, Faith, hope, jesus, knowledge, love, Prophecy, Saint therese, tongues | Permalink.